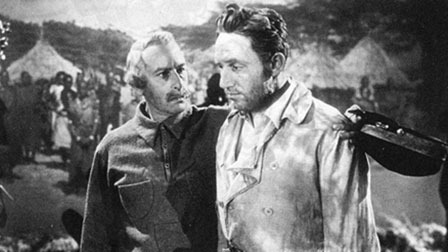 Cedric Harwicke (left) tells Spencer Tracy that life in the African bush isn’t all that bad. Sometimes we don’t care if a Based-On-A-True-Story movie is actually true. And if the movie stars Spencer Tracy, Cedric Harwicke, Charles Coburn and Walter Brennan, then we care even less. The movie in question is Stanley and Livingstone, a film based on the true story of explorer/missionary Dr. David Livingstone who went to Africa and disappeared. Stanley was the American journalist sent to find Livingstone and write the Story Of The Century. Stanley did locate Livingstone, and tried to persuade him to return to England but Livingstone refused. This much is true. We’re not sure about the rest. The movie feels like it could be true. There is Stanley’s journey to Africa, his trek through the bush, and his utter discouragement at being unable to find the elusive Livingstone. Stanley and Livingstone is an odd movie-watching experience. The Hollywood version of this story is fascinating and the cast is top-notch. But you can’t really relax until you know how Spencer Tracy (as Stanley) is going to deliver The Line. You almost have to make yourself forget that it’s coming. Spencer Tracy does not disappoint. When a weary Tracy sees Harwicke (Livingstone), he swallows the excitement at finally seeing this legend who, we see, is just a man in a cotton shirt with unusual pockets. Tracy asks the question respectfully, if not a little desperately, and it is perfect. The two men do not become instant friends. Livingstone, well-versed in the practicalities of living in rural Africa, has a way of making Stanley feel small, but not undeservedly so. Also, each is disappointed by the other. Stanley is disappointed Livingstone isn’t leaving with him; Livingstone is disappointed that Stanley didn’t come to help. There isn’t a lot of action in this movie; there is drudgery. Stanley & Co. march for miles searching for Livingstone then, when they find him, there is even more marching as Livingstone walks throughout an enormous territory to visit and treat people. We’d imagine that trickiest part of this movie would be depicting a saint. This would be Livingstone, who devotes his life to healing, teaching and exploring. Livingstone could be a dull character, but Harwicke gives him depth and warmth, and you find yourself filled with admiration and respect. Stanley and Livingstone is a slower-paced movie, but it is absorbing. There is a lot of silly business at the end which is so ridiculous it makes you cringe, but the first three-quarters of the movie are worth it. It makes you think about Africa and how it’s been exploited by other areas around the world. It will also make you want to learn more about two fascinating men who remain legends to this day. Stanley and Livingstone: starring Spencer Tracy, Walter Brennan, Cedrick Harwicke. Directed by Henry King. Written by Philip Dunne and Julien Josephson. 20th Century Fox, 1939, B&W, 100 mins. Definitely going to check this movie out. I’ve always been fascinated by this story. The story of Dr. Livingstone is a fascinating one and Hollywood back then was incapable of telling the whole story. In fact, I wonder if today’s Hollywood would want to tackle the tale. Even so, this movie is worth seeing because of the 4 actors you mentioned. Just love watching them. By the way, wasn’t 1939 a fantastic year for Hollywood? Truly her best year. 1939 truly was Hollywood’s golden year, and here is another example. It would be interesting to see Hollywood re-make this movie… It would be much grittier than this version! Sounds like I have another enjoyable evening to look forward to in my future. I will look for this movie….and then I will look for a man sporting unusual pockets who I presume will be Livingstone! Ha ha! If you see this movie, let me know your opinion of Livingstone’s shirt pockets. Maybe this is more common than I realize. Ha ha – yes those pockets are a bit unusual. I’m sure they served some practical purpose…? Because so much of my Spencer Tracy appreciation is a spill-over from my Katharine Hepburn love, there are key parts of his filmography I’ve yet to see – this being one of them. The bits I know about this (and its history) comes from my knowledge of “Heart of Darkness”. The legend of it is intriguing, though, I have to seek it out sooner or later. And Tracy is very adept at inhabiting characters you wouldn’t expect him to play as well as he does. I agree – Tracy is SO GOOD at playing all kinds of characters and makes each one believable. Hope you get a chance to see this one; Tracy is definitely worth the price of admission. Thanks for stopping by! “There isn’t a lot of action in this movie; there is drudgery.” What a brilliant description and an accurate one and one (no doubt) intended by director Henry King. The fact that it’s not an adventure film by definition is what makes S&L stand out. Yes, King’s direction really makes you feel the enormity of Stanley’s search, and you’re also aware that Livingstone was certainly not living a life of luxury. It is a really interesting film. I was doing online searches of both men while I was watching it. Fascinating story. Growing up, a couple of Fox biopics used to play all the time. This one and “The Story of Alexander Graham Bell.” Now they’re next to impossible to see, though I understand the Bell title is coming out on the Fox MOD program. I recorded the Tracy from TCM and have yet to watch it. But its funny how some movies were prevalent in their day and now are hardly seen anymore, even in the classic movie outlets. That is funny – how some movies are popular then suddenly not. I had recorded “Stanley & Livingstone” when it was on TCM a few months ago, and finally had the chance to see it the other week. I’d be interested to hear your analysis when do you see it. Great review. I’ve seen this movie, but not for a long time. I mainly remember it for Spencer Tracy’s performance. Now I want to see it again to take it in more fully. Spencer Tracy is always amazing, isn’t he? He makes acting look so easy – even when it comes to portraying an icon. Have to see this one…the real Stanley was quite a character…as was Livingston. I am sure Hollywood gave the story a relatively “clean” treatment, but can’t pass up Spencer Tracy. Oh yes, I’m sure the real story was far more gritty, but Spencer Tracy is always worth the price of admission. Thanks for stopping by! I haven’t seen this, but it sounds very interesting – I’m trying to see as many of Tracy’s films as possible, so will look out for it! Hope you get a chance to see it – Spencer Tracy is a brilliant casting choice as the journalist Henry Stanley. But when is Spencer Tracy NOT a brilliant casting choice? This is an interesting movie for a couple of reasons. It suffers from coming out in 1939, which may be the great year of movie releases in history. 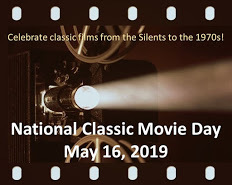 Its history might be quite different if it was not buried amongst the movie icons that also came out that year.The first thing I found worth noting was how Hollywood converted the basic western format into an African safari. You could see/hear so many western standard devices as you viewed the film. It was once stated that all movies can be converted into a cowboy movie. This movie was a very short trip in that respect.The second, and best part, was the whole historical concept of the story, despite the difference from the actual story, which were so eloquently detailed below. The story of this journey, along with the journey of Lewis and Clark, or one-armed Capt. John Wesley Powell through the southwest, especially the Grand Canyon, make up some of the greatest adventures of modern times.All in all, this movie is a good adventure. Spencer Tracy never disappointed me in a film. My favorite performance by him is Edison The Man. Spencer Tracy has never disappointed me, either. To pick a favourite performance is tough! Have you seen Tracy in Edison The Man ? That is my all-time favorite movie of his. Other Tracy films that are underrated include Northwest Passage and The Devil At 4 O’Clock. Never liked him much with Hepburn with the exception being Guess Who’s Coming To Dinner. What?! You don’t list “Adam’s Rib” as one of your all-time favourites? I respect Hepburn as an actress and I have seen at least 25 of her films but I don’t see the greatness in her work that other people do. Besides The Philadelphia Story, Guess Who’s Coming To Dinner and On Golden Pond, I just don’t see it. I know I am in the minority but that’s my opinion. “The Devil at Four O’Clock” is a film I’ve never seen. Judging by how high it ranks on your list, this is one I’ve gotta see soon! I agree with you when it comes to Hepburn. She’s not my favourite, but a person can respect the work she’s done. I am a huge fan of Sinatra’s music and I think he is a magnificent actor as well. He does a great job in The Devil At 4 O’clock along with Spencer Tracy. The film will touch your heart. I might be a bit sappy but those are the movies I seem to like best. Heading to the opposite end of the spectrum, I think Sinatra in Suddenly is his best movie overall. Hope you enjoy The Devil At 4 O’clock, it is not a great film but a very good one. Tracy and Sinatra did work well together in this flick.